Prilosec OTC® is dedicated to providing results that improve the lives of our consumers. We are the #1 Doctor†, Gastroenterologist|| & Pharmacist|||| Recommended OTC Frequent Heartburn Medicine for 10 straight years. 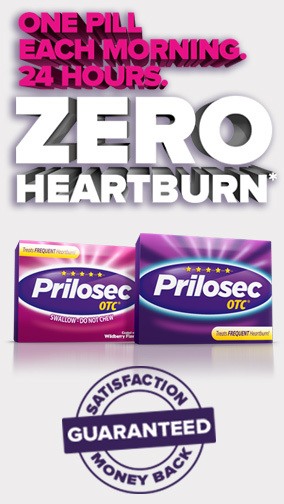 Prilosec OTC works by shutting down many of the pumps in the stomach that produce excess acid. It's also clinically proven to block heartburn for 24 hours* with 1 pill each morning and satisfaction is guaranteed. If you are not completely satisfied with your purchase of Prilosec OTC, we'll give you your money back. Refunds are limited to only 1 (one) refund request on any 1 (one) size package of Prilosec OTC per household. For any questions regarding usage and dosage, please contact P&G Consumer Support. doctor. May take 1 to 4 days for full effect. Not for immediate relief. †||AlphalmpactRx ProVoice Survey, Jan 2005 – Mar 2016. ||||Pharmacy Times Surveys, Acid Reducer/Heartburn Categories 2006 – 2016. To receive your full money back in the form of a prepaid card please Mail: This original form, Original UPC from the package, Original dated sales receipt within 60 days of purchase, with store name and product purchase price circled in a stamped envelope to: Prilosec OTC Money Back Guarantee, Dept. B, PO Box 1108, Grand Rapids, MN 55745-1108. All fields are required. Select One14 ct.28 ct.42 ct. Please fill in the address. AlabamaAlaskaArizonaArkansasCaliforniaColoradoConnecticutDelawareDistrict of ColumbiaFloridaGeorgiaHawaiiIdahoIllinoisIndianaIowaKansasKentuckyLouisianaMaineMarylandMassachusettsMichiganMinnesotaMississippiMissouriMontanaNebraskaNevadaNew HampshireNew JerseyNew MexicoNew YorkNorth CarolinaNorth DakotaOhioOklahomaOregonPennsylvaniaPuerto RicoRhode IslandSouth CarolinaSouth DakotaTennesseeTexasUtahVermontVirginiaWashingtonWest VirginiaWisconsinWyoming"
Check out the full details of our Privacy Statement. Valid on one Prilosec OTC 14count package, Prilosec OTC 28count package, or Prilosec OTC 42count package. Moneyback guarantee not valid for any Prilosec OTC product reimbursed or paid under Medicaid, Medicare, or any other federal or state healthcare program, including state medical and pharmacy assistance programs, or where prohibited by law. Money back issued via prepaid card. Offer limited to US residents only, 18 years of age or age of majority or older. Limit one refund per name, household, or address. Use of multiple addresses or P.O. boxes to obtain additional refunds is fraud and may result in prosecution. Multiple submissions will not be acknowledged or returned. Prepaid card accepted where Visa® cards are accepted. Not redeemable as cash or usable at ATMs or gas pumps. Card expires 6 months from issuance. Terms of prepaid card apply. Refund is limited to the purchase price and excludes taxes and any incidental or consequential damages, negligence, strict liability or any other legal theory. Some states do not allow the exclusion or limitation of incidental or consequential damages, so the above limitation or exclusion may not apply to you. This guarantee gives you specific legal rights and you may also have other rights, which vary from state to state. This form must accompany your request. Original dated sales receipt must be dated by June 30, 2019 and requests must be postmarked no later than July 31, 2019. If UPC and valid original date receipt are not included in the request for refund, your prepaid card will not be issued. Reproduction, alteration, sale, trade, or purchase of this official form or proof of purchase is prohibited. Proof of purchase must be obtained from product purchased by you. No requests from groups, clubs, or organizations will be honored. We will not honor incomplete submissions. Not responsible for lost, late, or undelivered submissions. Please allow 6-8 weeks for delivery. Offer is valid for U.S. residents only. © 2019 Procter & Gamble. All rights reserved. This site is for the use of U.S. residents only.